Simply put, when you're determining how to price wealth management services, competing on price alone is dangerous. Instead, what needs to come into play when you price your business is the value of the services you provide and how much your time and knowledge are worth. Using this formula, a $500,000 producer with 250 client households will earn $2,000 per client per year. Assuming this producer works a typical work week—that’s 2,000 hours annually—he or she will earn $250 per hour. 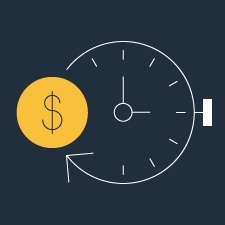 Say, for example, that all of the services you provide to your client outside of portfolio management will take you an additional 10 hours per year. You might then charge a $2,500 yearly retainer fee for that work. Kitces runs the numbers slightly differently, but the result is similar and ensures that you are compensated for your time and expertise. 2) Affordability for your clients. The downside to pricing services based on the cost of your time is that you may price out certain clients—I’m thinking particularly of millennial investors, who, arguably, could stand to benefit most from your guidance. You might think that they aren’t your ideal clients anyway, but I would suggest that they could become so over time, with your help. 3) Pricing based on value. Your clients need to view your relationship as rewarding; otherwise, they’ll go somewhere else to find quantifiable value. But how do you define perception? If you charge a monthly retainer of $208 ($2,500 per year), and your client is willing to pay that amount, then that’s how much your client values your time. Still, says Kitces, you need to make sure you have a clearly defined niche—and then provide services that are unique to that niche. Perhaps you work with women business owners, doctors, or divorcees. Services of particular value to these groups may be long-term care planning, budget analysis to identify savings gaps, or social security planning. If you promote these services to your client base, and your clients find them valuable to their financial well-being, they’ll pay what you charge. When determining your fee, I think you'll find that evaluating the three factors above is a great start. But you'll also need to qualify where you are today, so you can quantify where you want to go. Your answers to these questions will help you do just that. What stage of business are you in? Young and growing or mature? How often do you meet with clients—quarterly, semiannually, or annually? Will you expect your clients to provide referrals or introductions to potential new clients? Do you have significant competition in your area? Do you position yourself as a lower-cost provider or a provider of premium service? Do you expect to have more or fewer clients? In the end, you need to forget about what everyone else is charging. The fee you charge is a lot like your fingerprint; it’s your own and it shouldn’t be like someone else’s. 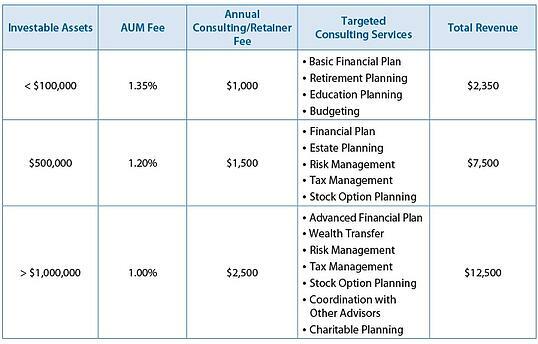 The truth of the matter is that many advisors today are charging fees for wealth management services, and they are all targeting the same clients you are. How can you differentiate yourself? The best way is to focus on being client-centric. What do your clients need? What challenges or opportunities haven’t they considered? Addressing every aspect of your clients’ financial lives not only leads to more rewarding relationships for you but also makes your services more valuable to your clients. What other factors do you consider when pricing your business? Do you look at what your peers are charging? Please share your thoughts with us below!